Port Moresby (EMTV): Most manufacturers in PNG are struggling with high cost of production, resulting in their products selling at higher prices than similar goods imported abroad. The Independent Consumer and Competition Commission (ICCC) says this is because general manufacturing costs of PNG manufacturers are high, where costs for all production inputs are relatively high compared to other countries that produce competing products. But some manufacturers say if the National Government reduces some of the costs imposed on them, consumers can be able to enjoy cheaper products. For most low and middle income earners and ordinary Papua New Guineans, the purchase of store goods, depends on the pricing. According to ICCC, products manufactured in PNG cost more due to the cost of production inputs such as land, infrastructure, fuel, materials, electricity, water and port services to name a few. 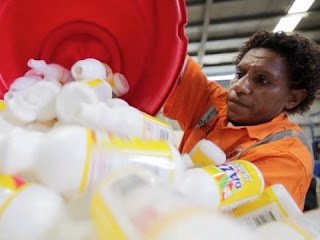 “If PNG manufactured products are more expensive, compared to imported products, it is due to the fact that the general operational costs of PNG manufacturers are high,” said Dr Manoka. Some of the production input like water and electricity are owned by the government and supplied through state owned enterprises. Some manufacturers say if the government reduces the bills charged on them, the cost of the products sold can be reasonably reduced. According to SP Brewery’s General Manager Stan Joyce, the government should look at reducing the cost of water and electricity supplied to manufacturers. The similar statement was made by Akzo Nobel PNG’s General Manager Mikael Ruben. “Producing in PNG is very expensive. If the government looks at reducing the cost in that area, it will have a positive impact on our costing,” said Mr Ruben. It is now up to the government to consider such suggestions in order to alleviate the struggles by PNG manufacturers and consumers alike.